Army Men are boyhood toys: they are recklessly strewn about to fight in play war by Lil' Despots that have never seen the real thing. The causus belli? You can make one up. The outcome? Whuu? You leave them stranded out in the back yard when you go in for supper. Your Dad chopped them up with the lawnmower...or your dog chewed on them? There's more where they came from. They're cheap and expendable. They're plastic. They will live forever; transfixed in the agony of having a leg snapped off or from being melted with some pilfered matches. And because of your limited attention span, you instantly move on to other things like Hot Wheels, or Hide and Go Seek with the Mexican kid down the street. Maybe take a picture of your deployment of these Plastic Grunts for Peace and send it along. 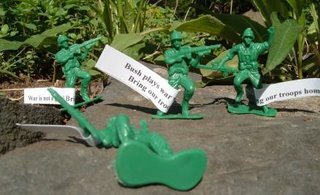 Let our collective compassion and concern for the poor bastards over there (ours, theirs, military, civilian), and our desire that our troops be sent home be as non-biodegradable and incorruptable as the plastic Army Men themselves. I've been gearing up to do this, I've also spotted a prime stretch of pavement for some Freeway Blogging. I just bought a bag from Walgreens (note appropriate name of business from which to purchase said green army men). I'm in the process of thinking about my message, but stumbled a bit as to what to do with the tanks that came with the pack. I couldn't find any with out tanks...but then, I thought, hey - you go to war against war with the army you can buy, not the army you wish you could buy. Maybe, I'll deploy my tanks as well. Count me in...oh, and I am thinking about using my fresh faced LT (read, two year old son) to help distribute said battalion. Great idea. Sign me up! I like this, kinda MailArt like. Hope you don't mind I copy and put a link to my blog? If so, let me know and I'll delete it. Cheers from the underbelly of the midwest, via SF! Y'know, if one didn't even look too deeply, one could see great irony in the fact that 100 of these just costs $1.00. It's an apt representation of how much our real soldiers are valued by this administration. About a dollar's worth.